Voted by the Pittsburgh fans as the greatest right-handed pitcher in Pirates history, Deacon Phillippe may have been the greatest control pitcher ever — his 1.25 walks per nine innings is the lower ratio of anyone who hurled after the modern pitching distance was established in 1893. Longtime teammate Honus Wagner recalled that Phillippe "wanted to hurl against the other team's best pitcher and often worked out of turn to do it." Although he was a six-time 20-game winner, never had a losing season, and won 189 games in a 13-year major league career that didn't begin until he was nearly 27 years old, he is best remembered as the as the winning pitcher in the first modern World Series game. The son of Andrew Jackson and Margaret (Hackler) Phillippe, Charles Louis Phillippe (pronounced PHIL-uh-pee) was born on May 23, 1872, in Rural Retreat, Virginia, a tiny town in Wythe County where his family had lived for many generations. He was one of eight children, having two brothers and five sisters. The spring that supplies the town with water to this day is called Phillippe Springs. When Charlie was three, his family moved to the Dakota Territory near the town of Athol. He grew up and learned to play baseball on the prairies of what would become (in 1889) the state of South Dakota, and he would play semi-pro ball there for many years. By 1896, he had moved on to Minnesota, and that year he played professionally for a team in Mankato. The next year Phillippe hooked on with Minneapolis of the Western League, where he pitched for two seasons, in the second of which he posted a record of 21-19. After the 1898 season, he was drafted by Louisville, and at age 26 he was finally in the major leagues. On May 25, 1899, he pitched a no-hitter against the Giants in only his seventh major league game. He would go on to post a record of 21-17 in 321 innings for the eighth-place Colonels. 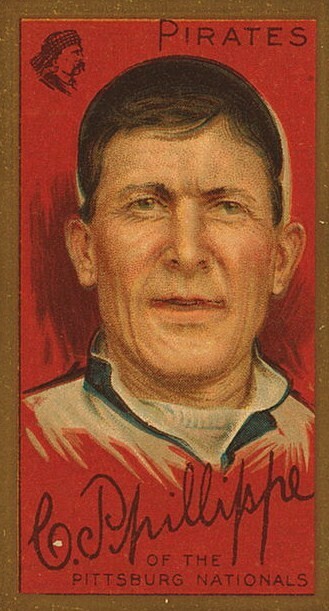 He was one of many Louisville stars who moved to Pittsburgh in 1900 when the National League contracted to eight teams. Standing a shade over six feet and a muscular 180 pounds, Phillippe was described as "a handsome man [with a] sturdy oval face, a lantern jaw, and dark hair parted a shade left of center." Though his friends usually called him Charlie, Phillippe acquired the nickname "Deacon" in the very early days of his major league career. He was not a clergyman, though he did lead a church choir in the off-season. He picked up the name because of his reticent demeanor, his humility and the way he lived his life. In the words of a sportswriter analyzing an upcoming season, "He will be there again, as strong and good as ever, for Phil never does anything during the winter that would result detrimentally to him." He would be a long-time friend and teammate of Sam Leever, a pitcher with a similar disposition and strikingly similar record, who was known as "Professor" or "Schoolmaster". Though the Pirates had a deep and talented pitching staff during his early years, Philippe was probably their biggest star. A right-handed pitcher with an above-average fastball and curveball to go with his exceptional control, he won 20 or more games in each of his first four years in Pittsburgh, to extend his streak to five years for his career. His best season was 1903, when he and Leever were asked to make up for the defections of fellow pitching stalwarts Jack Chesbro and Jesse Tannehill to the American League. Phillippe opened the season with a two-hitter to defeat the Cincinnati Reds, and did more than his share over the rest of the summer, furnishing a record of 25-9. When the Pirates recorded a record six consecutive shutouts mid-season, Phillippe pitched the first and fifth games of the streak. Phillippe's finest hours came in the 1903 World Series. The Pirates pitching staff had been depleted by the nervous breakdown suffered in September by 16-game-winner Ed Doheny and by an injury to 25-game-winner Leever. Deacon beat Cy Young in the first game in Boston, 7-3 with a season-high ten strikeouts, causing Boston manager Jimmy Collins to admit, "Phillippe pitched in masterly style" and Fred Clarke to add that "the Deacon was never in better condition, the way he cuts loose with the benders is a caution." He pitched a four-hitter to win the third game and, after a travel day and a controversial rainout, won the fourth game as well 5-4, after which the Pirate fans hoisted him on their shoulders and carried him around Exposition Park. With the best-of-nine series tied at three games apiece, Phillippe pitched the seventh game in Pittsburgh before a crowd that chanted, "Phil, Phil, Phillippe, Phil; He can win and you bet he will". Clever verse aside, Deacon lost to Young, 7-3, and three days later lost the eighth and final game as well, 3-0. In the eight-game series spread over 13 days, he pitched five complete games, recording all three of his team's victories. It is unlikely that this performance will be matched any time soon. To show their appreciation, Pittsburgh fans presented him with a diamond horseshoe stickpin and team owner Barney Dreyfuss rewarded him ten shares of stock in the club. The secret of his pitching success was, according to comments he gave to The Sporting News, was "keeping batters guessing. I study the batsman in every way: his position in the box, his general attitude, the way he holds the bat, and any other individual characteristics he may have." There was talk that off-season of reducing to three the number of balls that would result in a walk. Deacon did not think this would affect him: "It is a cold day when I get three balls on a man." After cashing in on his fame by playing with the Pittsburg Five, a basketball team captained by Honus Wagner, Phillippe contracted an illness early in the 1904 season that settled in his eyes, causing him to be hospitalized in late May. He managed only 19 starts that year, and had his least effective season, 10-10 with a 3.24 ERA. He returned to form in 1905, winning 20 games again, and posting a 2.19 ERA. By 1906, Phillippe was 34 years old, and began to have the chronic arm problems that would plague him for the rest of his career. Over the next two seasons, he started 50 games and relieved in 18 others. He was still effective, winning an aggregate 29 and losing 21. In 1908 Deacon pitch only 12 innings the entire year, missing a few weeks with a sore shoulder and, after returning to the mound, breaking his finger when a line drive off the bat of the Phillies' Red Dooin struck his pitching hand. Still not ready to retire, in 1909 the 37-year-old hurler was used as a spot-starter and reliever for the champion Pirates. He fashioned an 8-3 record, with a 2.32 ERA, and pitched six scoreless innings in his return to the World Series. The next season he was mainly a relief pitcher, and he finished 14-2 with a 2.29 ERA. A lifetime .189 hitter, Deacon entered the record books that season when he connected for an inside-the-park grand slam, becoming the last pitcher to accomplish the feat until Mel Stottlemyre did it in 1965. He won his last 13 decisions, which turned out to be the last decisions of his career. Deacon left the Pirates after a few ineffective appearances in 1911 but returned to baseball the next year as the player-manager of the Pittsburgh entry in the outlaw United States League, which played its home games in Exposition Park, the Pirates having abandoned it in 1909. His team, which the press dubbed the Filipinos in deference to their manager, finished the aborted season with the best record in the league at 16-8. In 1913 he managed the Pittsburgh team, also called the Filipinos, in the Federal League, a year before it became a "major" league. Like many players, in later years Phillippe looked back fondly on his own era in the game. In 1946 he told The Sporting News: "Babe Ruth was the biggest drawback to smart baseball the game has ever known. Teams quit playing smart baseball and went in for slugging. I think that's what's wrong with baseball today. Everybody is aiming for the fences." Phillippe was married in 1912 to Ella Buch, with whom he had three children (Charles, Florence, and Louis). At some point thereafter, Ella and Deacon went their separate ways, though there is no evidence that they divorced. According to a descendent, Ella precipitated the separation, and Deacon had very little contact with his family thereafter. Deacon spent the rest of his life with Belle Kennedy — it does not appear that they ever got married. Ms. Kennedy had a daughter, Isabelle, who lived with them as well. Following his baseball retirement, Phillippe worked briefly for a steel mill, owned and operated a cigar store, scouted for the Pirates, worked in their ticket office, held a post in the county parks department, and was a court bailiff, all in the greater Pittsburgh area, where he lived the rest of his life. In his later years, he and his Belle lived in Avalon. He died there on March 30, 1952 while watching television. An earlier version of this biography appeared in SABR's Deadball Stars of the National League (Brassey's Inc., 2004), edited by Tom Simon. After the original version of this story was published on the web in 2005, I was contacted by Robert DuBree, the great-grandson of Deacon Phillippe, who supplied missing information about Deacon's first wife and family (which were not mentioned in any of his obituaries). With the help of Richard Malatsky, I was able to confirm what Mr. DuBree told me. "Deacon Phillippe, Hill Hero of First Series in '03, Dies," The Sporting News, April 9, 1952: 25. Charles Phillippe file at the National Baseball Hall of Fame. The Sporting News. July 13, 1901; September-November, 1903; December 19, 1903; March 12, 1904; February 28, 1946. Stout, Glenn and Richard A. Johnson. Red Sox Century. Houghton Mifflin, 2000.